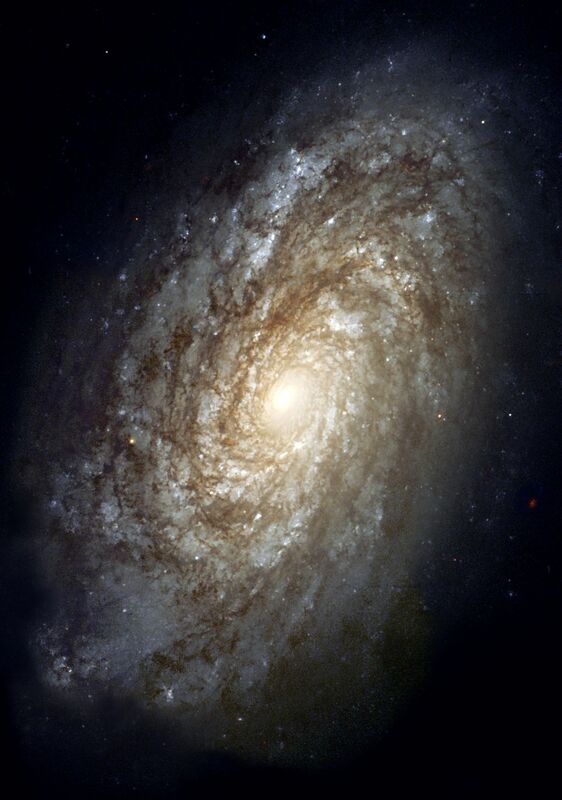 In 1995, the majestic spiral galaxy NGC 4414 was imaged by the Hubble Space Telescope as part of the HST Key Project on the Extragalactic Distance Scale. An international team of astronomers, led by Dr. Wendy Freedman of the Observatories of the Carnegie Institution of Washington, observed this galaxy on 13 different occasions over the course of two months. Images were obtained with Hubble's Wide Field Planetary Camera 2 (WFPC2) through three different color filters. Based on their discovery and careful brightness measurements of variable stars in NGC 4414, the Key Project astronomers were able to make an accurate determination of the distance to the galaxy. The resulting distance to NGC 4414, 19.1 megaparsecs or about 60 million light-years, along with similarly determined distances to other nearby galaxies, contributes to astronomers' overall knowledge of the rate of expansion of the universe. The Hubble constant (H0) is the ratio of how fast galaxies are moving away from us to their distance from us. This astronomical value is used to determine distances, sizes, and the intrinsic luminosities for many objects in our universe, and the age of the universe itself. Due to the large size of the galaxy compared to the WFPC2 detectors, only half of the galaxy observed was visible in the datasets collected by the Key Project astronomers in 1995. In 1999, the Hubble Heritage Team revisited NGC 4414 and completed its portrait by observing the other half with the same filters as were used in 1995. The end result is a stunning full-color look at the entire dusty spiral galaxy. The new Hubble picture shows that the central regions of this galaxy, as is typical of most spirals, contain primarily older, yellow and red stars. The outer spiral arms are considerably bluer due to ongoing formation of young, blue stars, the brightest of which can be seen individually at the high resolution provided by the Hubble camera. The arms are also very rich in clouds of interstellar dust, seen as dark patches and streaks silhouetted against the starlight.